By now, it’s common knowledge that QR codes are very powerful marketing tools. A fact of QR codes that usually goes unnoticed is that they can be used to market more than just companies and products; they can be used to market people and skills. To this end, QR codes have been becoming a major part of businesses cards and vCards, which are essentially virtual business cards. In this way, the codes are used to market skills to prospective employers and clients, as well as establish networking connections in various industries. To understand the appeal of a QR code vCard, you have to understand what a vCard actually is. A vCard is a file format that contains your contact information, such as your phone number or email address. Most vCards are very limited in the information they contain, used most often to share contact details between two parties. More advanced vCards, such as those that are commonly associated with QR codes, can be used to share websites, video, and other kinds of digital content. Making a business card with a QR code vCard is relatively simple. There is a wide range of QR code generators that are available for free on the Internet, but these generators typically only produce the QR code itself and not a vCard. Some online services offer to put QR codes on business cards, but these are typically associated with a modest fee. After deciding to make an interactive business card, you will have to choose a method regarding how to make a vCard with a QR code. There are two different methods when it comes to making a vCard with a QR code. The first method is known as, the direct method. Through the direct method you can add your contact information and any other relevant details directly to the QR code. This information can be accessed without a data connection, meaning that smart phone users won’t have to connect to the Internet just to see what information is stored on the QR code. Once the code is scanned, a user will have the chance to add your information to their mobile device so they can contact you more easily. These codes can be particularly useful in distributing your information very quickly, but using the direct method means that you cannot direct people to a website or some kind of digital content using your QR code. The second method — the indirect method — involves connecting a web address to a QR code. When scanned, this code directs people to a website containing some form of digital content, whether it be text, video, or something else entirely. These codes will require a data connection in order to be used, but are considered the more dynamic form of vCard. They also allow their owner to better showcase their skills to their potential connections. There are benefits to both methods, as well as drawbacks. With the direct method, whatever you associate with your QR coded vCard will not be able to be changed down the road. So, if your address, phone number, email address, or website changes at any point while you’re using the QR code vCard, you won’t be able to update your information. The indirect method allows you to change the information associated with your QR code vCard at any time because it is simply a website address, but these codes require a data connection to be used, potentially limiting their reach. 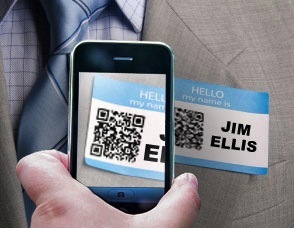 When making a vCard with a QR code, you’ll have to focus on more than just the functionally of the code you are using. Business cards have evolved over the years to become more visually engaging and appealing. There are very creative ways to design your business card that will give you a leg up against your potential competition. That is, of course, if you’re not completely devoted to the idea of a vCard and want to have a more physical representation of your skills and abilities. Making a business card with a QR code can require some ingenuity. Typical business cards are rectangular cutouts with some text on them. This is not a concrete rule, of course, just a standard that many people have adhered to for several years. You can make you business card look like and do anything you want. Take Peipei Yu, an acclaimed graphic designer, for instance. Peipei Yu designed a business card that uses a QR code. The code itself is not the centerpiece of the design, of course, as Yu decided to turn his entire business card into something more interactive than a common piece of paper. Yu’s business card features a punch out that acts as a stand, allowing the card to stand upright. Beyond that, a few strategic folds allow you to turn the business card into a tiny box. Designs like these are sure to make you stand out and create a memorable experience for anyone you give your business card to. Making a QR code vCard may be a little trickier than just making a QR code itself, but the potential benefits of the extra work you put in could be significant. Coupled with the fact that you have a lot of options concerning how to create a QR code, such as making a visual QR code or incorporating a code into you logo, a QR code vCard is something you’ll want to consider if you want to show yourself off in a new and innovative way. I guess it all comes down to making the QR code scanned afterwards to be more of an impact than just the business card. Like making the website responsive so that if a person scans the business card, they would be sent to the website in a mobile responsive format. Now for the interactivity part of that would maybe add a little discount lead traffic or something. Like using the AddThis Bar to convert the visitors to something cool and personal maybe?